Is everyone ready for the weekend? I know I am but first I have a bunch of things to tell you about. If you are looking for a good read this weekend, click over to All Things Girl. Christine has two beautiful pictures featured and Jodie has an excellent review of Pat Barker’s Life Class. Way to go girls! Also, if you haven’t checked out Natasha’s Reading & Blogging For Darfur project please go check it out. Spread the word and let’s raise awareness. 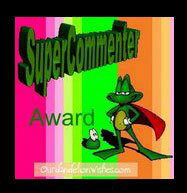 And, last but not least, thank you to Marg & Melody who passed on the Super Commenter award to me. Isn’t that sweet? I do love to chat so I guess this proves it. heehee. This weekend I’m hoping to catch up on some reading and you know, it’s been a while since I’ve gone to the library so maybe I’ll have to spend an afternoon among the stacks. I love weekend even more once the school year has begun. I have plans to finish a book and then work on a new journal that I want to use for my teaching reflections this year. I am also thinking a stroll through the bookstore with a latte is in order. Enjoy your weekend. Ahh, weekend! Glorious, glorious weekend! I’ll finally be finishing a book: I Am Legend for the RIP III. Have a great one, Iliana! I need to stay away from the library I think! My current piles at home are already too tall! 🙂 Have a great weekend and enjoy your books! I’m going to go curl up with one now, I think! 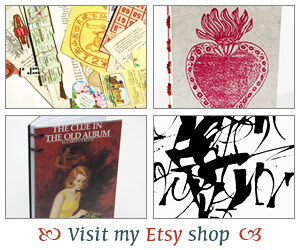 Juliann – I hope you’ve had a chance to spend some time at the bookstore this weekend. It’s funny, I’m not working right now but still the weekends are something I look forward to! Chris – I hope you’ll enjoy it!